Continuing on in my Boba Fett series, we next reach “Star Wars: The Clone Wars”. When Boba Fett is shown to be a clone of his father, Jango Fett, in “Star Wars, Episode II: Attack of the Clones”, he is unique in that his growth is not accelerated, but, otherwise, just like all of the clone troopers. 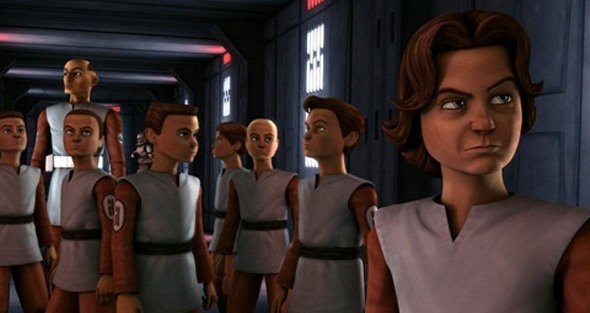 “Star Wars: The Clone Wars” takes that idea to its logical conclusion (and brilliantly so!) in “Death Trap”, an episode towards the end of season two: not only does he look like other clones (for half his age), but he also has a desire for vengeance of his father’s death at the hands of Mace Windu. While this is the first time we see Boba Fett in the series, we are not introduced to him as Boba Fett – he calls himself “Lucky” and transfers onto a ship with other similarly-looking clones – where he is covertly seeking to assassinate Mace Windu. By bringing him into the picture here, one wonders: where has Boba Fett been since his father’s death, what has he been doing, and who has been looking after him? Was he able to return to Kamino in his father’s quarters and to be watched over by whomever watched over him whilst his father was still alive? We don’t know. While doing target practice with other clones, he is able to shoot exceedingly well – much better than the other clones. However, he is twice their age…. He goes to the core reactor, where he is confronted by a clone trooper – he somehow manages to wrangle a blaster from him and, upon being threatened, the clone trooper says “We’re brothers; don’t shoot!” Boba says: “You’re not my brother.” Instead of fatally blasting him, he stuns him. Boba Fett is in league with Aurra Sing, who had only appeared previously in “Star Wars: The Clone Wars” in the last episode of the first season, as a sharpshooter in cahoots with Cad Bane (her first appearance on-screen was in “Star Wars, Episode I: The Phantom Menace” as a spectator at the podracing on Tatooine). When she boards his escape pod (which he has sabotaged, thus making them go beyond the rendezvous point) from Slave One, she insists that he kill the other clones, to which he protests: “I just wanted to kill the Jedi that murdered my father.” Finally, how did Boba Fett connect with Aurra Sing?